The essence of “Mamma Mia!” doesn’t live in the haphazard plot or less-than-professional singing that people are quick to critique — it’s in the sparkle, joy and funky outfits that the entire cast sports and the story of strong women making their way in a rich man’s world. If you’re still nitpicking, it’s probably because you’re taking yourself too seriously, more seriously than the actors who bring the movie to life with their unabashed spirit. The movie leaves you smiling with shots of energy such as “Dancing Queen.” Meryl Streep, 59 years old at the time, proved that nothing should ever be able to stop you once you put your mind to something. You don’t have to be 17 years old to do a full split in the air, you can somersault into water if you set your mind to it, and you sure as hell shouldn’t let life get in the way of having fun. In addition to the feel-good ABBA music that has everyone singing along, the movie does a great job of giving women a spotlight. The movie is about a mother-daughter duo and their friends, and refreshingly enough, it doesn’t revolve completely around men. “Mamma Mia!” passes the Bechdel test pretty easily since the storyline weaves through Donna and Sophie’s plans for the future as fiercely independent and determined women. 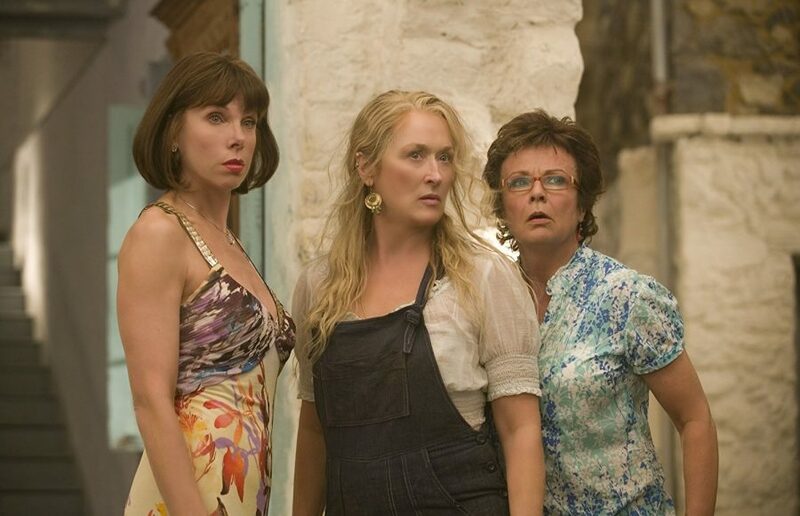 It’s important to have media texts that women can relate to and feel good about, and “Mamma Mia!” in all its glory is a glittery, carefree rendition of what we need to see more of. The cast members are not professional singers. It’s clear, and people like to point it out. We know Pierce Brosnan — who previously played James Bond — can’t hit those notes, but he can rock a Lycra jumpsuit and platform boots to hit the stage and be a sport about it. He recalled filming “Waterloo” in his shiny, slightly obnoxious ensemble and bumping into Daniel Craig, the new James Bond, who was filming at the same studio. If you think you’re too high and mighty to appreciate “Mamma Mia!” remember that it was a hit for one of the unarguably coolest movie characters of all time (who wore skin-tight outfits to dance and sing in). So, give the movie another chance. Watch it again, and this time agree to have a bit of fun, turn off your text analysis skills, and settle down to enjoy it with a martini — shaken, not stirred.